During our most recent excursions, we obviously looked out for those colourful Afro-tropical migrants that typically arrive in June-July, moving north with the rains – think cuckoos, rollers, kingfishers, etc. We saw some of course, especially at Wassadou but even in the bone-dry landscapes of Gossas and Diourbel, where we had migrants such as Diederik Cuckoo and Grey Hornbills. Less expected were a number of breeders from the Western Palearctic that are now supposed to be in full breeding mode, so I thought it would be interesting to review these here. Of course, numerous “WP” species that winter in Senegal can be seen here year-round, but these are mostly waterbirds such as Eurasian Spoonbill, Black-tailed Godwit, Audouin’s Gull and other waders, gulls and terns. Many young birds of these species will actually remain in West Africa during their first summer, and from the end of June it’s quite normal to see early returnees, particularly for waders that failed their breeding season and left Europe early. A Western Marsh Harrier (Busard des roseaux), probably a young female, flew over the flock of Greater Flamingos and other waterbirds that we’d just been counting at Lac Mbeubeusse, one of the niayes wetlands on the Cap-Vert peninsula, then landed in a reedbed. Some summer observations are known from both Senegal (“a few birds summer”, Morel & Morel) and Mauritania (June-August; Isenmann et al. ), and Barlow & Wacher mention that occasional non-breeders are seen “during the rains” (a rather vague way to refer to summer, which doesn’t really tell us whether the records were actually during summer or whether they refer to regular migrants in September & October!). Also here on the same day (23.6) was at least one immature Purple Heron (Héron pourpré) which may be either an oversummering bird of European origin, or a wandering African bird – I’m yet to figure out whether the species breeds anywhere nearby, though it’s clear that in potential breeding areas such as Technopole the species is absent during ~March to early August (further south, I have records from May-June, in Kolda and Toubacouta). 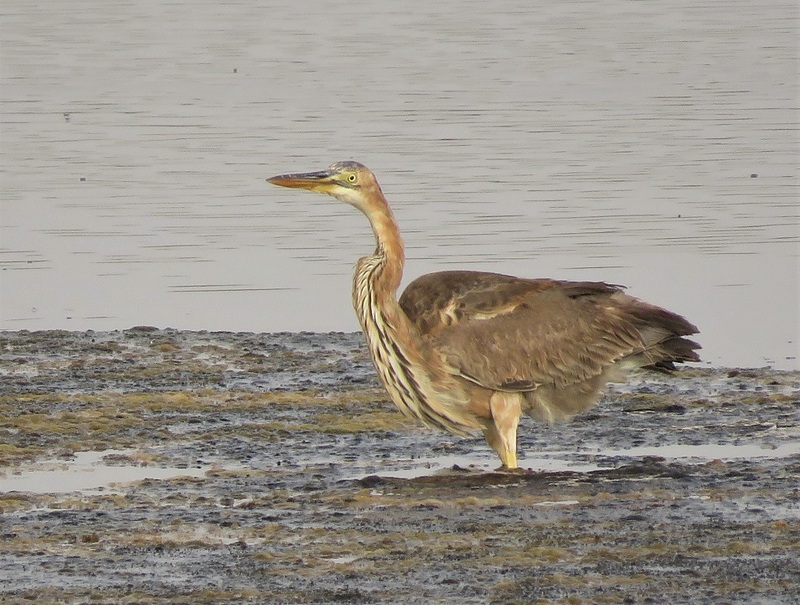 Still at Mbeubeusse – a decent birding site I’d never visited before despite being not far from Dakar! Never too late… – we also saw a winter-plumaged Knot (Bécasseau maubèche), feeding together with a group of Grey Plovers and a handful of Greenshanks and Redshanks. (Pluvier argenté, Chevaliers aboyeur et gambette). While the latter three species are more or less to be expected at this time in Senegal, the summer record of Calidris canutus may be noteworthy. Two subadult Yellow-legged Gulls (prob. 3rd c.y. ; Goéland leucophée) were at Lac Rose on 23.6, resting together with a group of some 500 Lesser Black-backed and 200 Audouin’s Gulls (Goélands bruns et d’Audouin), several of which were ringed including a Portuguese bird that I’d already seen back in April at Technopole. Also in the group were two or three Kelp Gulls (Goéland dominicain). Yellow-legged Gull is rather scarce here at any time of the year so it was a nice surprise to see these; apparently the species has been “recorded in all seasons” in Senegambia (Barlow & Wacher). Both birds seemed to be typical nominate birds (i.e. from southern Europe) rather than atlantis birds from the Macaronesian islands. A week earlier at Wassadou and along the road from Tambacounda to the Niokolo-Koba, we noted a good presence of Common & Pallid Swifts (Martinets noir et pâle), which appears to be not unusual at this time of the year since non-breeding birds are said to move north with the rains from their “wintering” grounds over the forest zone of West Africa. There are however few June records (e.g. Barlow & Wacher give a presence of Pallid Swift from July-September and November-January). 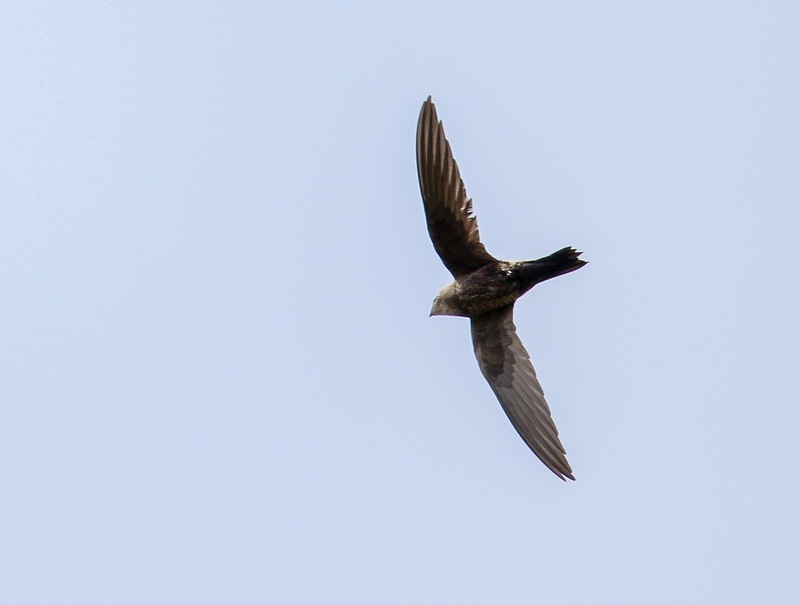 Even more exciting was the presence of several Mottled Swifts (Martinet marbré) at Wassadou, the first June record of a “difficult” bird in the region – there appear to be less than 10 records for Senegal in total, all of which are from the Niokolo-Koba area. The one below was seen by my Swiss friends in the PNNK earlier this year. Perhaps more surprisingly than the preceding species, two European Bee-eaters (Guêpier d’Europe) were feeding and flying around pretty much all afternoon on 23.6 in Almadies, Ngor, regularly calling in the process and as such giving away their presence above and near my house. 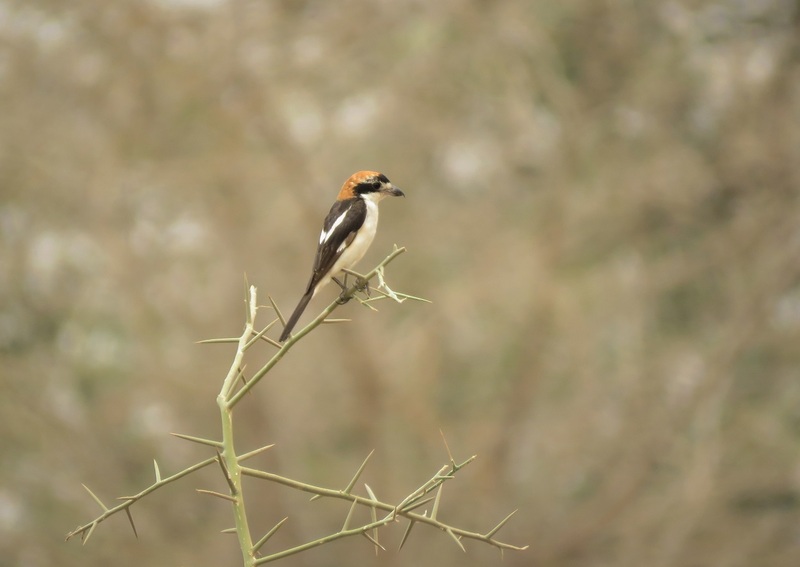 I’d never seen the species before in Dakar (though I have seen them not far, along the Petite Côte in autumn), so this was a highly unexpected record. Paul Isenmann and colleagues mention that the species is present in Mauritania from July/August to October, and March to May/June, but I didn’t find any references to summer records in Senegal or Gambia. 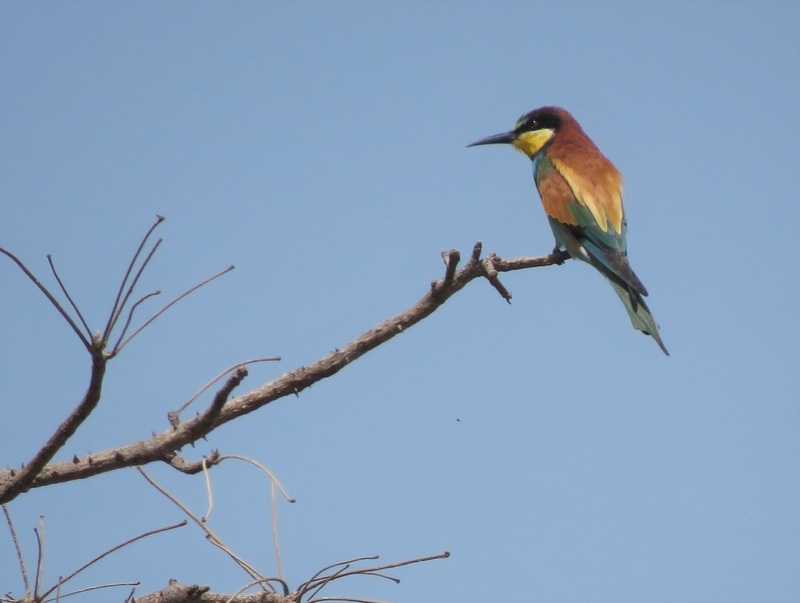 Probably just a coincidence, but earlier the same day we saw our first Blue-cheeked Bee-eaters in the Dakar region, at Lac Rose (Guêpier de Perse). Perhaps these were birds en route to their breeding grounds in northern Senegal? A single House Martin (Hirondelle de fenêtre) at Wassadou on 15 & 16.6 was also remarkable: a very late migrant, an oversummering bird, or a wanderer that decided not to bother going all the way to Europe? The species has been recorded Oct. – June and I’ve seen birds as late as 28/5 at Technopole, but it’s clear that there are very few records from late June and July. A few kilometres further north, Miguel and I observed a Western Olivaceous Warbler (Hypolaïs obscure) at Wassadou, feeding in bushes on the edge of the Gambia river, on 16.6. This is of course a common to very common winter visitor throughout the country, and there are records from all month, so maybe not as surprising as the previous species. Now often called Isabelline Warbler, it is also known to be summering at Nouakchott (June-July) with no noticeable break between pre- and postnuptial passages (spring: March – May/early June, autumn: July-October; Isenmann et al. 2010). A couple of days later near Diourbel, we had a Woodchat Shrike (Pie-grièche à tête rousse), apparently a first-summer male: the forehead is extensively black and mantle seems mostly jet-black (both features indicative of males), while the moult limit between the adult-type dark wing feathers and juvenile brownish unmoulted primary coverts and flight feathers are typical of 2nd calendar year birds (more on ageing & sexing the species here, from Blasco-Zumeta & Heinze’s excellent series on the topic). 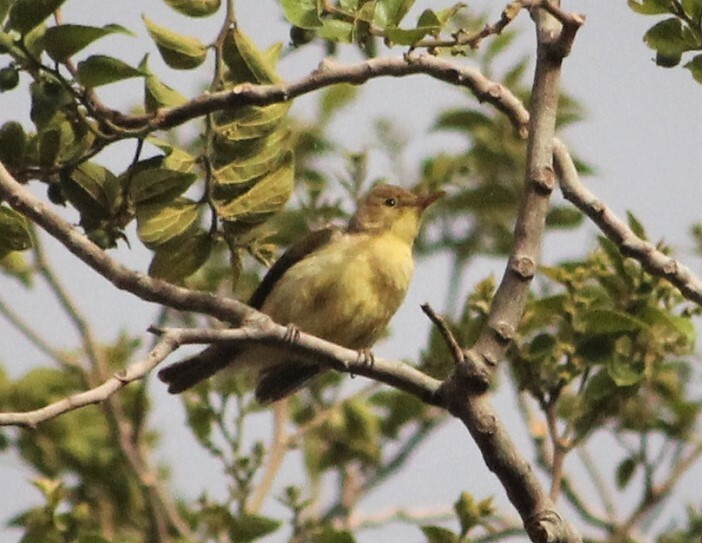 The presence of this species in Senegal is fairly similar to Western Olivaceous Warbler. An adult Great Spotted Cuckoo (Coucou-geai) earlier that day near Gossas was assumed to be an African rather than a northern migrant, though we can’t be sure of course; the date is consistent with the arrival of this cuckoo on its Sahelian breeding grounds (a couple of weeks later I had another adult, actively calling, though a bit further east: along the Niger river near Niamey). Voilà for now; for me it’s time to migrate north for a couple of weeks (though no breeding for me this summer); I’ll be back towards the end of the month. And maybe find some time to finish a few blog posts that have been dormant in my draft folder for a while now… Thanks for reading! Another wonderful, in-depth blog. Thanks so much Bram. Wonderful photos too. Enjoy your holiday!